There are many things that tug at our heart strings during weddings, from the first moment a couple locks eyes on each other, to the parent dancing and toasts, we often find ourselves soaring with happiness for our clients. There is one thing that never fails to both make our hearts sing and make us laugh – and that’s kids at weddings. You are sure to find tons of sentimental moments with kids: we’ve seen flower girls tossing petals, kiddos tearing up the dance floor, and future stand-up comedians putting on a show. We love it all and can’t wait to share a few of our favorite kid moments from the 2018 wedding season. Being this cute is exhausting! What’s the sweetest moment you’ve seen with a kid at a wedding? We want to hear your stories! Special thanks to the lovely photographers we get to work with for capturing these shots. 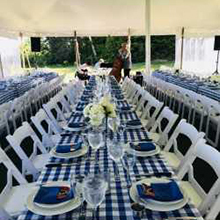 This fun-loving couple made their wedding into a whole weekend affair at their lake-side venue, Kingsley Pines, on Sebago Lake. After yoga classes, fun on inflatable lake floats, food trucks, and more, the weekend culminated in a Sunday ceremony and reception. Following the ceremony, guests enjoyed a cocktail hour by the lake complete with a bluegrass band and a portable bar in an airstream trailer. Guests enjoyed dinner on farm tables with views of the lake. To keep the fun going, friends and family were given scratch tickets to win money for charity. A firework show on Sebago Lake kept the party going before guests danced the night away in the barn! 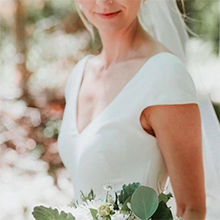 Whitney and Zach made their rustic-wedding dreams a reality this past weekend at Live Well Farm in Harpswell, Maine. A beautifully lit barn, outdoor tent, and close proximity to the ocean ticked all the boxes for a Maine summer wedding. The charming attached farm house provided an intimate space for family and friends to get ready for the big day. 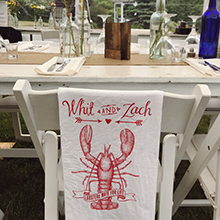 Antique bottles and personalized lobster-bibs provided memorable touches. 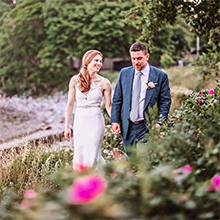 Rory and Steve got married at the very same place they met years ago: Ocean Gateway in Portland, Maine. 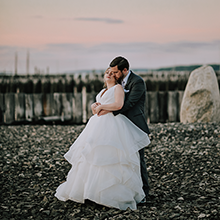 The couple enjoyed perfect Maine weather in an outdoor ceremony and celebrated that evening in a venue with panoramic ocean views. Photo by Erica Godino with Closer North. Toasts with props had the whole wedding in fits of laughter!